It was a dark and rainy day--and I needed a break. That usually means driving a hour-ish to the malls we are in--and picking up our monthly checks. I take the opportunity to take up some fresh inventory, reduce some prices, move around the inventory and general primping. There is an added bonus this year. Pearce's Vegetable Stand north of Walworth. It is like the stands I remember in Wisconsin from my youth. And when I learned that this one has been in place for 45 years--it IS a stand of my youth. It only opens mid summer--and I wait for that day eagerly. Open air and hjammed with homegrown glory. 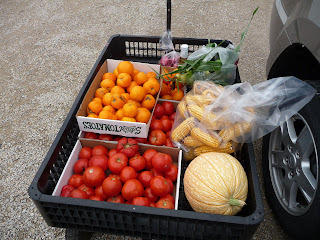 Wagons of potatoes-eggplant-squash-sweet corn picked 10 minutes ago--and TOMATOES. I have made several trips this summer--and I am freezing sauce like a house afire. And YELLOW tomato sauce. Marvelous. We go to many auctions in southern Wisconsin and Northern Illinois--and we were beginning to think that the age of the box lot was passed. Thanks heavens it has not. Not even at the swanker auctions. 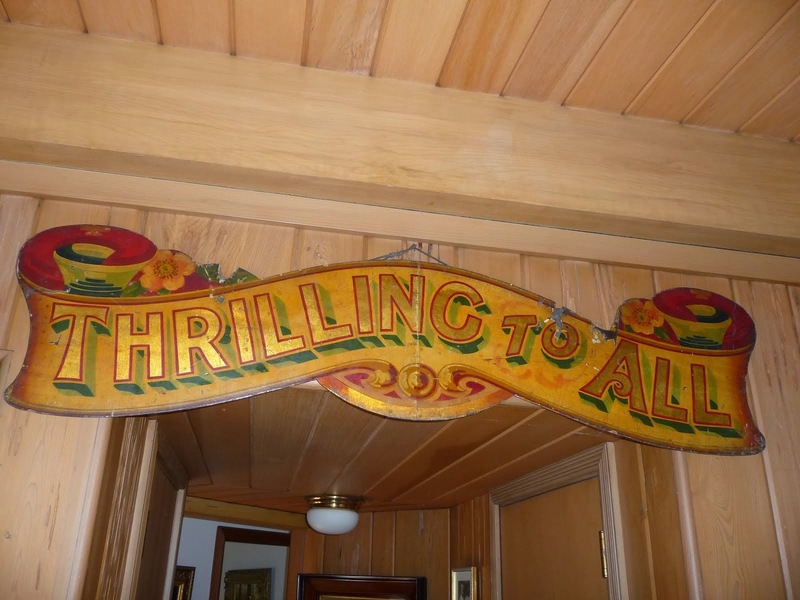 We attended an auction recently--and the best goods that day were to be found in box lots. Some auctioneers take each little consigned widget and auction it off separately. It is much easier for a dealer to make money if several items are thrown together--sometimes actually in a box and sold at one price. Last weekend I struck auction gold in a box of books. 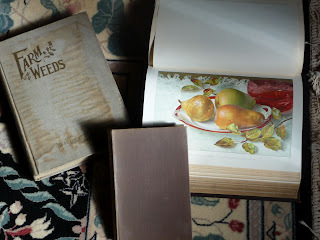 I love books about plants-vintage household hints-and copies of classics. This was a botanical find. Farm Weeds by George Clark (1909) Jammed with color drawings of weeds--incredible! Gardener's Assistant by Robert Thompson (1904) Full of color botanical drawings. Today is supposed to be cleaning house day. Instead--it is 15 minutes cleaning-15 minutes reading.